This is part #2 of our blog series on The Three Luxury Real Estate Marketing Keys for Personal Branding. Define. Align. Refine! The process of personal alignment is taking the time to formulate and reformulate your success formula by trying out different ideas in your imagination until all these gears click into place. Only then can you send a clear, non-contradicted signal to your target market. Anything less is like tuning in a radio and hearing static. 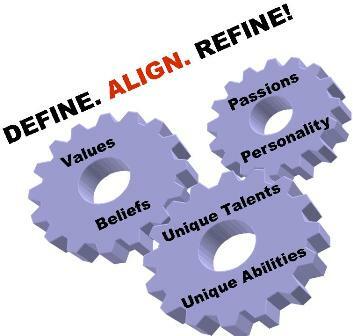 Without alignment your target market is getting mixed signals from you or cannot even hear your broadcast. And, you wonder why all of your hard work isn’t paying off as you had hoped it would. It’s not for lack of effort on your part. It is lack of alignment! Most professionals are too eager to rush into action before achieving personal alignment. Then they wonder why they are getting mixed results. Do not underestimate the importance of this vital step in building your luxury real estate marketing practice. Any time you notice that you are not getting consistent results, take more time out for personal alignment or realignment. Once you complete the process of self-definition covered in Part 1, and personal alignment covered here, you will experience the feeling of being "centered" which we cover in Part 3. You will also be able to effortlessly define your unique selling proposition, which we cover in Part 4 and refine your marketing message, covered in part 5 of this series. View our ongoing article series about Luxury Real Estate Marketing . Get Fluent. Get Affluent! Subscribe to The Language of Luxury by Email or RSS Feed. Comments? Please use form in left column.